Mee goreng recipe. 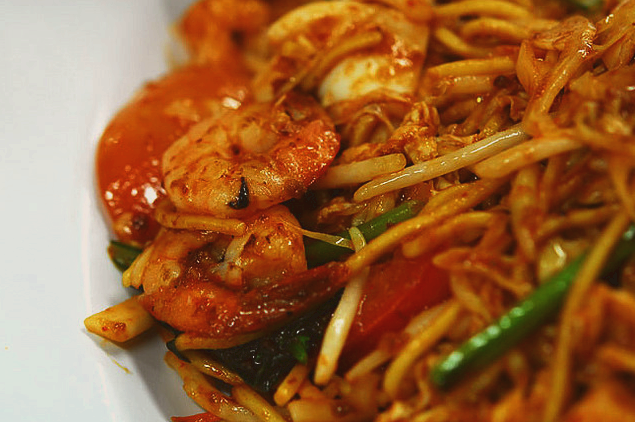 Mee Goreng is a favourite dish of Singaporeans. Mee goreng is well liked by all races for its spicy and tasty flavours and comforting quality. Although without egg, this version is simple yet tasty. Heat oil in a medium wok and cook the sliced onions until softened. Add blended ingredients, cook till fragrant. Put in oyster sauce, tomato sauce, diced tomato and 2 tbsp broth. Stir and mix well. Simmer for 1-2 minutes. Add in prawns, squid and vegetables. Stir. Add in sliced fishcake. Add sugar, salt to taste (optional) and sweet soya sauce. Stir and mix well. Add in yellow noodles and beansprout. Mix and cook until the noodles softened and blended well with all the ingredients. Add 2-3 more tbsp of broth if you don’t like your mee goreng to be dry. Garnish with lime, chinese chives or coriander leaves. Serve hot. This is not mamak mee goreng. can someone post the recipe? great post! the picture looks fantastic.. Tasted great! Hubby and I really enjoyed it. We love it egg-less! My teenagers liked it, too! This was a hit among my family members,gonna make again this weekend. Good to hear tHat! Not tOo much oily food ok.
Wellcome. Nice to have you too! Always season your dish with salt last to taste. I make that a habBit.